A textile is a flexible material comprised of a network of natural or artificial fibers often referred to as thread or yarn. Yarn is produced by spinning raw wool fibers, linen, cotton, or other material on a spinning wheel to produce long strands known as yarn. Textiles are formed by weaving, knitting, crocheting, knotting, or pressing fibers together. 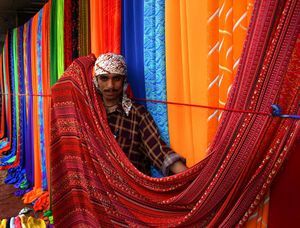 Textiles have an assortment of uses, the most common of which are for clothing and containers such as bags and baskets. In the household, they are used in carpeting, upholstered furnishings, window shades, towels, covering for tables, beds, and other flat surfaces, and in art. In the workplace, they are used in industrial and scientific processes such as filtering. Miscellaneous uses include flags, tents, nets, cleaning devices, such as handkerchiefs; transportation devices such as balloons, kites, sails, and parachutes; strengthening in composite materials such as fibre glass and industrial geotextiles, and smaller cloths are used in washing by "soaping up" the cloth and washing with it rather than using just soap. Textiles used for industrial purposes, and chosen for characteristics other than their appearance, are commonly referred to as technical textiles. Technical textiles include textile structures for automotive applications, medical textiles (e.g. implants), geotextiles (reinforcement of enbankments), agrotextiles (textiles for crop protection), protective clothing (e.g. against heat and radiation for fire fighter clothing, against molten metals for welders, stab protection, and bullet proof vests. In all these applications stringent performance requirement must be met. Weaving is a textile production method which involves interlacing a set of vertical threads (called the warp) with a set of horizontal threads (called the weft). This is done on a machine known as a loom, of which there are a number of types. Some weaving is still done by hand, but the vast majority is mechanised. Textiles are often dyed, with fabrics available in almost every colour. Coloured designs in textiles can be created by weaving together fibres of different colours ( plaid or ikat), adding coloured stitches to finished fabric ( embroidery), creating patterns by resist dyeing methods, tying off areas of cloth and dyeing the rest ( tie-dye), or drawing wax designs on cloth and dyeing in between them ( batik), or using various printing processes on finished fabric. Woodblock printing , still used in India and elsewhere today, is the oldest of these dating back to at least 220AD in China. Textiles are sometimes finished by starching, which makes the fabric stiff and less prone to wrinkles, or by waterproofing, which makes the fabric slick and impervious to water or other liquids. Since the 1990s, finishing agents have been used to strengthen fabrics and make them wrinkle free.